Slay the Spire will leave Early Access on January 23, developer Mega Crit Games announced in a weekly update. Trading cards, Steam Workshop support are on their way, along with a price hike after the Winter Sale. It’s a roguelike adventure up a magical—and extremely dangerous—tower, with cards representing your character’s combat and adventuring skills. Each character has a unique set of cards, and you can pick from more than 200 while trying to create your deck. You get these cards from killing enemies, mostly, forcing you to improvise instead of creating a deck at the start. These cards define your character, so you’re essentially building a class as you ascend the tower, with cards standing in for the gear and magic an adventurer might find in a conventional roguelike dungeon delve. And then you die, a new tower is generated and you can start building a new character with a new deck. 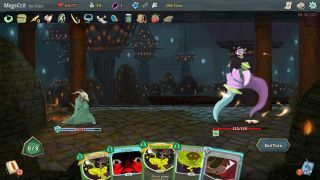 It’s a novel system and Slay the Spire has had a pretty successful Early Access, garnering quite a bit of praise. Check out our Slay the Spire preview from last January, and keep an eye out for our review next year. Today's update is a small one that fixes some bugs and adds a bit of polish. Read the full patch notes here.